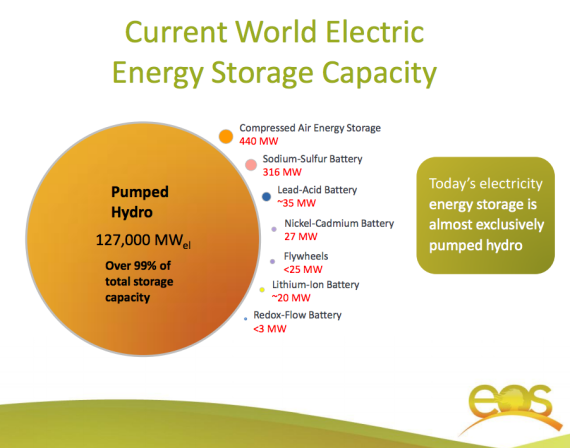 We’re creating a resource page on some of the most standout energy storage options moving towards commercialization. 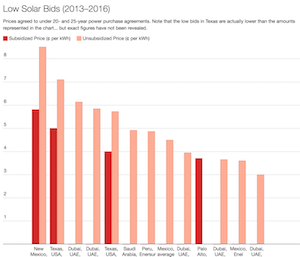 If even one of these technologies makes it to market with the specs claimed, it could change the energy game. Let’s hope that happens. 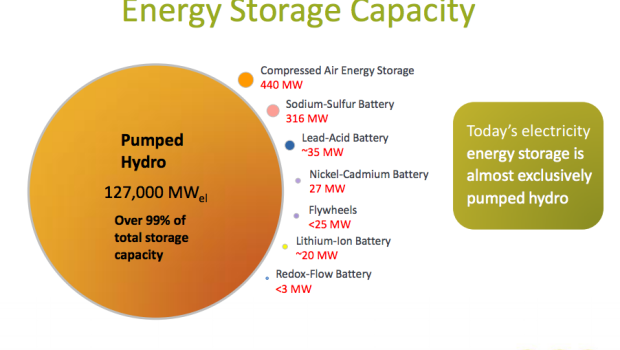 The first article in this series was about the zinc-iron redox flow batteries Zinc Air Inc. has been developing under the radar up in Montana. 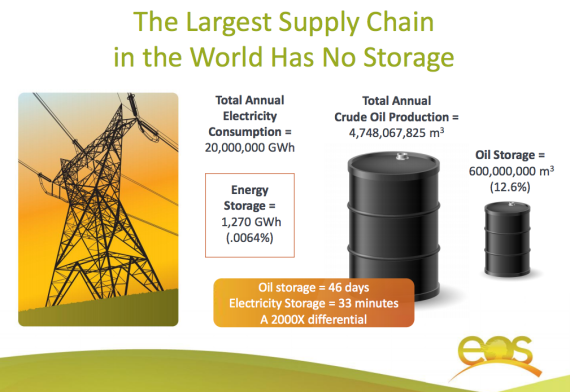 In this post, I’ll delve into the claims Eos Energy Storage is making about its own zinc-based batteries, which are initially being targeted for grid storage application. The battery Eos has been developing is a zinc-air battery, which would probably draw some flags for you if you keep up with this sector of cleantech in a bit of depth. Zinc-air batteries have a number of shortfalls that make them less than ideal for grid storage (i.e. cycle life and efficiency issues). However, in a presentation about Eos that I watched last year (sorry, the video doesn’t seem to be online any longer), the claim was that the company’s zinc-air batteries were nothing like conventional zinc-air batteries — that they had built the batteries from the ground up in a completely different way than was previously done. As far as I know, the details of that are under wraps at the moment, but if you have specific questions, I’m pretty positive we could get folks from Eos to answer those in the comments below. Based on publicly published documents for its grid-storage battery (the Eos Aurora), Eos is presenting cycle life, cost, and efficiency data that puts its technology in very good light. 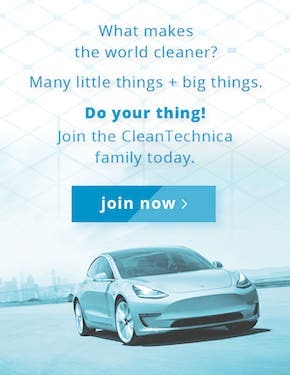 As you can see in the image below (click here to see a larger version), the claimed cost is $1,000/kW or $160/kWh, the cycle life is 10,000 full cycles (30 year life), and the storage system has a 75% round-trip eﬃciency. 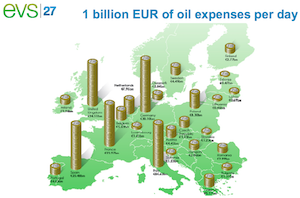 And, as such, the LCOE is very competitive. Eos is currently scaling up prototypes of its battery technology (5kW/30kWh units). They are to be manufactured this year, and are to be delivered to customers in early 2014. 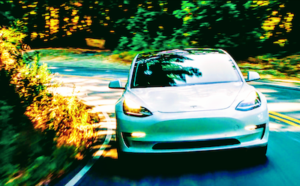 All well and good, if the technology does indeed come to market as laid out — with the specs above — and without any significant drawbacks unmentioned by the company. 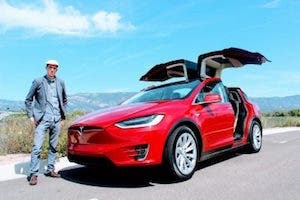 And one more thing that sets the Eos battery apart is that it could be applicable in the electric vehicle market, as well as the grid storage, industrial, and commercial markets. For the EV market, it says it has developed a 70kWh battery that is capable of getting over 350 kilometers of range for $10,000. 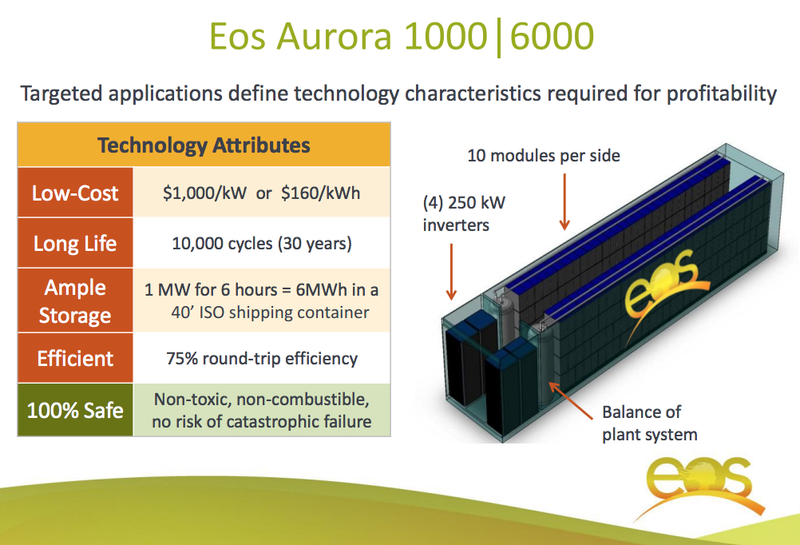 However, it is initially just starting commercialization of its grid storage battery, the Eos Aurora. 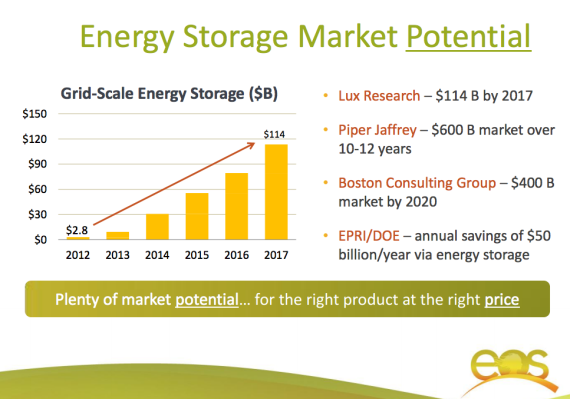 As we’ve reported several times here on CleanTechnica, demand for energy storage is increasing and the market is projected to skyrocket in the years to come. Energy storage will help to integrate more renewable energy into the grid when it matures enough that it is creating excess generation (which already beginning to happen in some regions). But, even beyond that, our grid and vehicle infrastructure have been greatly overbuilt in order to deal with our lack of competitive storage technologies. As old power plants come to a close, it would make sense to refrain from overbuilding and simply build more energy storage capacity… if competitive energy storage technology is on the market. 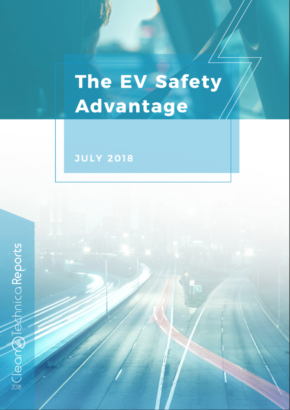 For a lot more information on the Eos zinc-air batteries — as well as its EV battery and white goods market strategies — check out the full public presentation thar Eos released in February.